More 4 Mom: Big savings from Mixbook, every thing is on sale! Big savings from Mixbook, every thing is on sale! 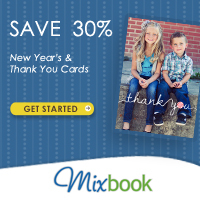 Mixbook is welcoming the New Year with a discount that is sure to excite! From now until January 9th, Mixbook is offering 30% off all of their impressive products. Create a custom Photo Calendar filled with the events from 2011, save on your Year in Review books, or order more New Years cards to send to your family and friends you "forgot" to send greetings to! Restrictions: This offer is only valid with coupon code NEWYEAR30. This offer cannot be combined with other coupons, vouchers, Groupons, or applied after an order has been placed. Discount applies only to completed projects. No adjustments on previous purchases. Shipping and taxes will apply. Offer expires 1/9/2012 (11:59 pm PST). Visit Mixbook now to take advantage, as this sale expires soon!